Former USDOT secretaries panel at ARTBA’s P3s in Transportation Conference, from left to right: Moderator Jennifer Aument of Transurban, the 2018-19 P3 Division president; former DOT secretaries Samuel K. Skinner, 1989-91; James H. Burnley IV, 1987-89; Rodney E. Slater, 1997-2001; and Mary E. Peters, 2006-09. 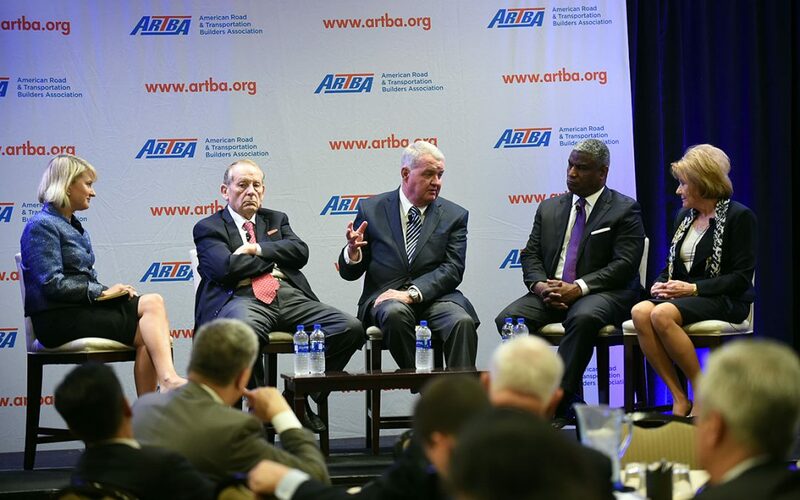 The debate over funding U.S. transportation infrastructure is at an important crossroads, former Reagan Administration U.S. Department of Transportation (USDOT) Secretary James Burnley IV said July 19 at ARTBA’s 30th Annual P3s in Transportation Conference. “The Highway Trust Fund has collapsed, not is going to collapse, it has collapsed,” Burnley said. “There are major challenges in the next two or three years, especially with the [FAST Act surface transportation] reauthorization,” which is scheduled for 2020. Burnley, in office from 1987-89, participated on a panel with former USDOT Secretaries Samuel Skinner (1989-91), Rodney Slater (1997-2001), and Mary Peters (2006-09). Another panel featured former ARTBA P3 Division presidents Ray Tillman (1996-97), Phil Russell (2006-07), and Tom Stoner (2012-13), along with the Reason Foundation’s Bob Poole. There was general agreement among the two panels that P3 financing and projects have come a long way in the last 30 years. The panelists also agreed that a lot of work remains, especially convincing the public that private participation in building and operating transportation infrastructure isn’t just a profit grab. Slater suggested the federal motor fuels tax that supports the Highway Trust Fund (HTF) could still be increased as “part of a patch” for public sector transportation investment. In 1993, the last time the gas tax was raised, it was part of deal to reduce the federal deficit. “We have to address the Highway Trust Fund, or we are doomed to suffer consequences we can’t even imagine,” Slater said. Skinner said public funding for transportation infrastructure is unlikely to remain at that the same levels as the past. He said governments increasingly have to focus their limited resources on infrastructure, such as sewer systems, that don’t offer the same user interface options as transportation to attract private capital. Panel moderator Jennifer Aument of Transurban, ARTBA’s 2018-19 P3 Division president, said the public is becoming more sophisticated about linking what they pay to use tolled transportation assets with the value of their experience, including speed, safety and reliability. Former P3 Division President Phil Russell noted there are still inequities between what each state pays in federal gas taxes and what is returned to them for projects. That has prompted states such as California, Texas and Florida to explore new funding models. Poole, of the Reason Foundation, said he wants to see more P3 investment from both public pension funds and private equity. The combination will help spur more bipartisan political support, he added. He also suggested the Interstate Highway System is a good place to begin the transition from per-gallon to per-mile revenue generation by government. This could include rebates on gas taxes to convince people it is a replacement, not an add on.